The couple of weeks prior to our departure were exhausting, emotional and by far some of the best weeks of my life. We were constantly surrounded and uplifted by friends and loved ones. Friends who stopped by our home in the last days just to hug and talk and laugh and cry. Friends who came to pray. Friends who had us over for dinners and going away parties and family celebrations. 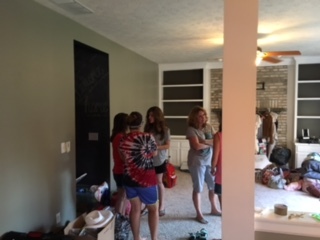 And in our final days when we needed places to stay, friends who opened their homes to our noise and chaos and plethora of bags and pillows and all that comes with opening your home to a family of six for the night. Love. Love. And more love. So much that my heart felt on the constant verge of bursting and my eyes felt on the constant verge of welling up and over into a pool of grateful tears. We didn’t deserve all of this, but it was being poured on us in buckets. It was a picture of grace. And then when I thought it possibly couldn’t get any better, that we couldn’t possibly feel any more love than we already had felt in the previous weeks – we walked into the home of our dear friends for our going away celebration. We spent the next hours in the company of loved ones – laughing, crying and saying, “Hope to see you soon” – which sounds so much better than goodbye. These days leading up to our departure and our final celebration served as a reminder for me. A reminder of what matters. God is relational and He created us in His image. He created us with a desire to be loved and a desire to love. Loved for who we are in all of our imperfection. Pure, unconditional love – like the love God shows us. Gracious love. People went out of their way time and time again to show us this kind of love. They took a moment from their own busy lives and busy schedules to pour into us. Looking back on the last weeks spent in Indy, I needed this and my family needed this. More than we knew. This time of love from friends and family filled my tank and also reminded me of how I want to live my life. It reminded me of the importance of a text. A phone call. A card. A hug. A shared prayer. It reminded me of the kind of friend I want to be and one that I oftentimes am not. It reminded me of the importance of leaving margin, leaving space, leaving room for God to show me how He may want me to spend my day. It reminded me of what matters. I often get wrapped up in my own little bubble. My own list of to-dos has the potential to rule every minute of my well planned out, perfectly orchestrated day. There is nothing wrong with calendars, to-do lists and schedules. In fact, those are wonderfully effective tools for living an organized life. The problem for me is when the calendar is so full that I can’t see past my plan for the day. I start my day in my bubble and forget to stop and think about what may be going on in the lives of the people God has placed around me. This kindness we experienced had a profound impact on me and has continued in our first days here. 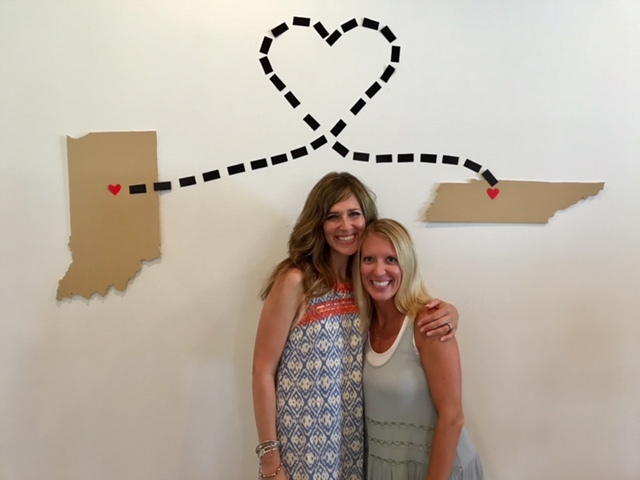 Prior to our move, a sweet friend from Indy introduced me to a mutual friend of hers from college who lives in the small Tennessee town we now call home. She took the time to introduce us via email and her friend was kind enough to invite me and the kids over the day before school started for some ice cream. Her three children are all close in age to our three oldest. She said she was just returning from a long vacation, but she would love to have us. Again, this made me stop and think. She made space for us. School was about to start and I had to imagine things were hectic for her. We were complete strangers and she made space for us. She invited us into her home. She fed my children ice cream and she gave me a hug. I want to live my life like this. I know it won’t be long before our calendars become full again, but I hope to not forget the impact that the love of others has made in my life and in the lives of my family members. I hope to remember the importance of leaving space. I hope to remember the importance of keeping my eyes open to what is happening in the lives of those around me. Neighbors. Friends. Family. Strangers. I was exhausted. I had cried many tears in the previous weeks, days, hours and minutes. It was a beautiful reminder of God with us. God carrying us. God leading us. I was exhausted, but I was ready. It was time. Time to trust. Time to let go. Time to open my eyes to the bigger picture of what God may be doing in my life. In my husband’s life. In my children’s lives. Change isn’t easy, but I have to believe it will serve a bigger purpose. I pray that as I begin this journey here I can love a little better. I pray I can trust a little more. I pray I can be the kind of friend that others have been to me. I pray I can live with space in my life. I pray the lessons I have learned in these weeks will be embedded deep in my heart. I pray they won’t be fleeting. I pray God will use me in this new space I occupy. Beautiful thoughts! Hope all is well! ? Thanks so much 🙂 It is getting better each and every day. Hooray! Heartfelt as usual. Well said as usual. Good advice as usual. Thank you for always reminding us, your readers, the best way to live our lives. God continues to use you as a role model.